Tanning Oil with SPF Protection That Is Safe For Skin - 3 Best Choices! “Safe” tanning oil with spf is kind of a two part phrase. No tanning is safe for your skin, and using an SPF laden sun block is the best defense against sun damage, aging skin, and skin cancer. However, there are products on the market that will allow some color to seep through, while still protecting your skin to a certain degree. 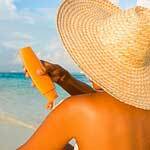 Tanning with sunscreen may seem like it’s impossible, but if you are looking for the right products, you will find everything from indoor tanning lotions for fair skin with an SPF all the way through to deep bronzing coconut oil tanning products that contain enough UVA / UVB ray fighters to ward off harmful sun damage. Check out our list of the 3 best picks for tanning oil with spf properties before heading to the store to take advantage of these well reviewed products! 1. Banana Boat Protective Dry Tanning Oil with spf 25: Get a little color and a little protection with this all day strong tanning oil. Boasting a long lasting dry mist formula and skin nourishing ingredients, this shockingly low priced find will leave your skin and wallet happy. 2. Alba Botanica Dry Tanning Oil with SPF 15: This non greasy coconut oil is an all natural tanning oil packed with shea butter and vitamin E meaning that your skin is getting extra love up above from this nutrient packed product. 3. Hawaiian Tropic Protective Dry Tanning Oil: For those of you on a budget, 12 SPFs for $4.00 is an unbeatable deal. Hawaiian Tropic’s long lived reputation for quality sun n’ fun lotions and oils is upheld with this protective yet effective tanning tool. Remember that tanning is never safe and that it’s extremely important to limit your sun exposure. If you intend to be outdoors for long periods of time, using the products mentioned above is not a good idea, and you will need to elect a product with a much higher SPF to keep your skin protected from the sun’s harmful rays. Remember to ensure that you are not tanning excessively or to the point of sunburn, because these will increase your chances for developing potentially deadly forms of skin cancer such as melanoma.